When I was a young whippersnapper myself, I saw Christopher Reeve in Superman and thought I want to be him. While my gym membership leaches a few handfuls of cash out my bank each and every month and I've lept the odd great distance, that's about as far down that career path as I've ever attempted. Not so Herbert Chavez. 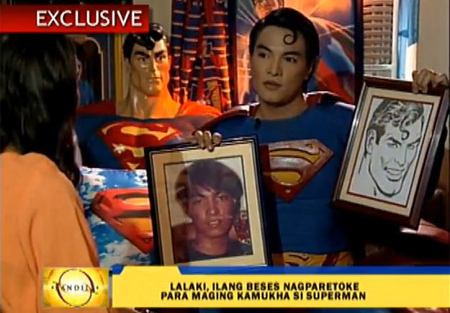 Herbert was so taken with Reeve's portrayal of the Man of Steel, he used his own super-savings to undergo plastic surgery, in order to rebuild himself in Reeve's likeness. While he only admits to having his nose done and legs extended, experts also say looking at footage of Herbert, he has had his eyes, cheeks and jaw altered too. Is it me or is even the Superman bust in the backdrop saying "WTF!". To see more photos of the beyond super-dedication click the jump - me I'm sticking with the gym and being thankful Herbert's favourite character wasn't The Beast! 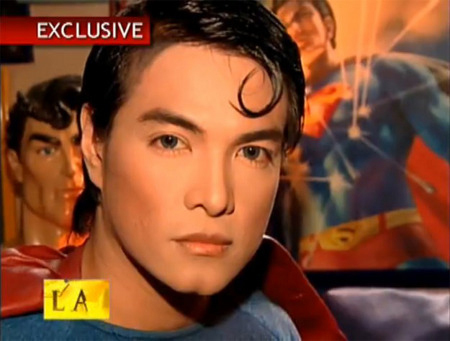 He wasted his money - he looks nothing like Christopher Reeve. Might be slight hint of Dean Cain if you squint a bit. Heya Kid! Welcome to IADW! Yeah it looks like the kick sailed a fair way left of the goal post to me too. But leg extensions? That's got to be all new kinds of ouch. Hopefully he can find somethin' more rewarding in life to apply that kind of determination too in future. I know that we're all uberfans of all things nerdifying and geeky in our own ways, and we all love a good cosplay. But I really hope this guy has a friend, or a family member that at some point will hold him back from doing anything else. Exactly Random. I actually wondered where they were when I read this. Wanting to improve and be the best you you can be is awesome. Wanting to be someone else, literally is different. Hopefully theres still time for him to step to the side, cast his own shadow, see it and say 'hey thats a pretty wicked trick' and continue in that direction. He looks about as much as Christopher Reeve's version of Superman as I do looking like Henry Cavill [please God, someday]. Some people take their obsessions too far, dont they. I think ive seen him being interviewed before somewhere in a newspaper. Really, his family should tell him to get some help [or at least a better plastic surgeon, he looks rather camp]. Unless its all for the attention....yes, thats it! He wouldnt allow himself to be interviewed otherwise, unless he wanted to see himself in the papers or tv. How sad tho, I mean hows he ever going ot get a job after revealing himself in this way, or even getting a girlfriend [edit - just saw his pictures, lol!]. This is a man who obviously spends far too much time on his Superman quiff and not enough on his...er, never mind. Years ago, in Edinburgh, there was a Pakistani comedian called Shabazz who used to go clubbing and shopping dressed as Wonder Woman, accompanied by what must have been a close personal friend as Steve Trevor [in uniform , no less]. Why dont I ever meet these people? Dan, your line should be one of the great quotes in human history, "Hopefully he can find somethin' more rewarding in life to apply that kind of determination too in future." hey mate, at least this guy wasn't trying to make himself look like michael jackson. this guy and the submarine paint HULK cosplay fail guy should hang out. Yeah if I magically turned into Henry Cavill's figure I wouldn't complain either Karl, instead I'm stuck doing squats, reps and praying at the gym and trying to avoid the fact there's a pizza joint cooking up a storm right next door. Dave I'm not quite Nelson Mandela yet, but I do think I have the odd bit of wisdom in me somewhere :) Glad you agreed with the idea mate, and as for pretend Hulk vs pretend Superman - well there's a match-up to end the arguments once and for all! Oh you fellas have got me rolling. I needed to put the coffee down this morning thinking about that fight. Wonder if we could get it televised? 'FAIL-celebrity Deathmatch'! I like it! Someone get FOX on the line. "You don't become like Superman by looking like him, you do it by acting like him." Poor kid doesn't look like Reeve at all. That is actually a sad atempt. Gymn is a good idea. that not so much. Who payed that surgery? I really hope someone helps that kid. That's one of the best quotes I've ever read Pensol! In fact I might have even indulged the inner Lex Luthor if you were me and I were you, and claimed it as my line masterful quote creation ;) Nice one! Heh. I heard it on a youtube video on the guy in question, Dan! But it's so true. Something as simple as helping an old lady across the street or volunteering for a soup kitchen - that's getting closer to the spirit of the character, not mucking about with your face. That guy just doesn't get it. hey Dan, he wanted to be Superman but he became Mr. Bean now.